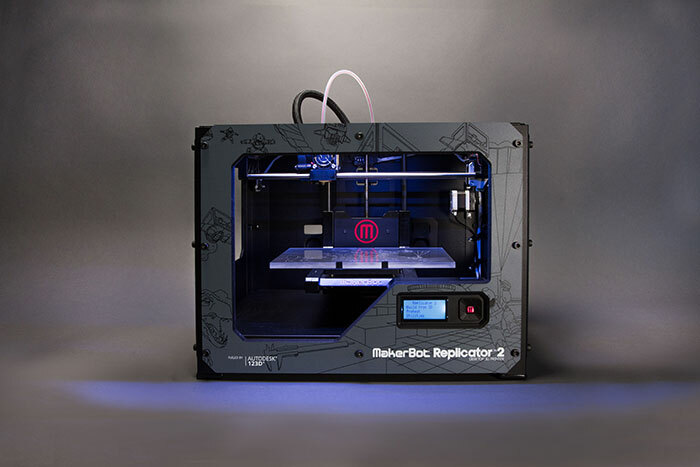 MakerBot and Autodesk Partner to Crowdsource 3D Printers in Schools! It’s funny that right after our last post about Obama’s Industrial Revolution speech in 3D, we got confirmation of a rad new program for high schools! Beginning November 12, 2013, individuals and corporations interested in helping get MakerBot Desktop 3D Printers in schools can visit DonorsChoose.org, a crowd funding site just for teachers, and pledge to financially support the program. Teachers then register on DonorsChoose.org for a MakerBot Academy bundle. MakerBot is contributing its own resources to launch this education initiative, along with Autodesk and other key partners. Each MakerBot Academy bundle contains a MakerBot Replicator 2 Desktop 3D Printer, three spools of MakerBot® PLA Filament, and a full year of the MakerBot MakerCare™ Service and Protection Plan. MakerBot will also support the teachers with the development of ongoing 3D printing curriculum that teachers can participate in and utilize in the classroom. MakerBot will leverage Autodesk’s software and educator curriculum as well. MakerBot is also launching a MakerBot Thingiverse Math Manipulatives Challenge. Math Manipulatives are one of the most requested items on DonorsChoose.org and are an item that can easily be 3D printed in the classroom. The MakerBot Thingiverse website will hold a week-long design challenge, from November 12 through 18, 2013, for its members to quickly develop a variety of different math manipulative 3D designs that can then be available immediately to teachers that receive the MakerBot Academy 3D printing package. A. Visit DonorsChoose.org and pledge your support. Individuals and corporations can help fund the MakerBot Academy 3D Printing package by making a tax-deductible donation via DonorsChoose.org. B. Tell schoolteachers about the MakerBot Academy program and encourage them to register on DonorsChoose.org right away. Students and their community can also help teachers raise the additional funds they need to bring the MakerBot Academy 3D Printing bundle into the classroom. C. Participate in the Thingiverse Challenge to develop models teachers can use to improve Science, Technology, Engineering and Mathematics (STEM) education. D. Visit makerbot.com/Academy. For more information on supporting or registering for the program, visit DonorsChoose.org. So join us in this effort (at an individual or corporate level) to help move America’s students to the forefront of technology and global competitiveness..! Next Make It REAL-ly Scary with 123D and Tinkercad: Contest Winners Announced!